It's "Summer Fun" challenge at One Stitch at a Time!! !I just wish Summer come here little sooner. 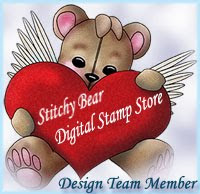 For my card i used Digital image by Stitchy "Mushroom Delight". You can perches image HERE. To color image i used Distress ink. To the centers of the flowers i added Glitter, and to the Mushrooms Crackle accents. To decorate i used Punches and dies, some gems and pearls, also this cute little snail. "Wishing you sunny days and happy hours" sentiment by Heartfelt Creations. Please stop by at the challenge blog for some more inspiration. Do you like to make money, $25 every day? Beautiful - love how the paper works so well with the image! Super cute. Love the colors you have used and such a darling little snail!!! New CD is out!!!! And Freebie!!!!!!! Amanda Berry and others are safe!!! Do you believe in Luck or God?? ?